Global diversification benefited investors in 2017 as international stocks posted their strongest gains since 2009. The S&P 500® Index of U.S. large cap stocks saw its strongest year since 2013, with positive total returns (including dividends) in all 12 months of the year for the first time in its history. Diversification in bonds also benefited investors as asset classes such as emerging markets debt, international bonds, and high-yield bonds posted strong gains in 2017. Fundamental Indexing pulled ahead during Q4 while market cap indexing led for 2017, demonstrating why Schwab Intelligent Portfolios includes both forms of indexing for diversification. Aggressive portfolios posted the strongest returns during Q4 and all of 2017, while more conservative portfolios delivered more moderate gains along with lower volatility. How did financial markets do in Q4 2017? One of the most notable market trends during 2017 was that volatility all but vanished amid the most synchronized global economic growth in a decade. With no major economies in recession for the first time in 10 years, stock markets around the globe overcame an abundance of geopolitical uncertainties to post their strongest returns in years. Emerging markets stocks jumped to the top of the performance charts, with a gain of 37% in their strongest year since 2009. International developed market stocks were also among the top performers, aided by the tailwind of a weaker U.S. dollar in 2017 and lower valuations than the U.S. stock market. U.S. stocks were no mere wallflowers amid the global rally, joining in to post their strongest gains since 2013 amid robust corporate earnings growth and a major U.S. tax overhaul signed into law near year-end. The S&P 500® Index of U.S. large cap stocks rose 22%, posting positive total returns (including dividends) in all 12 months of the year for the first time in its history. U.S. small cap stocks arrived fashionably late to the rally following a weak first half, but made up for it in the second half to end the year up about 15%. While the sizable gains across global stock markets in 2017 were welcome, it’s important to remember that markets are rarely so calm. Although markets post positive returns in most years, they typically see a significant pullback at some point during the year. Over the past 20 years, the S&P 500 saw an intra-year decline of at least 10% in about two-thirds of years even though it ended the year higher in all but four years. With the S&P 500 not having seen a decline of even 5% in about a year and a half, it would not be surprising to see a pickup in volatility in 2018. If you haven't revisited the Investor Profile Questionnaire since you opened your account, take a few minutes to review your answers to ensure they continue to accurately reflect your current goal, risk tolerance and time horizon. Source: Morningstar Direct, as of December 31, 2017. Performance figures shown are total returns for each asset class during the designated period. Indexes used are emerging markets stocks, MSCI Emerging Markets Index; U.S. large cap stocks, S&P 500® Index; international small cap stocks, MSCI EAFE small cap Index; international developed market large cap stocks, MSCI EAFE Index; U.S. small cap stocks, Russell 2000® Index; emerging markets debt, Bloomberg Barclays Emerging Markets Local Currency Government Bond Index; gold and other precious metals, S&P GSCI Precious Metals Index; international bonds, Bloomberg Barclays Global Aggregate ex-USD Bond Index; U.S. real estate investment trusts, S&P United States REIT Index; investment-grade corporate bonds, Bloomberg Barclays U.S. Corporate Investment Grade Index; high-yield bonds, Bloomberg Barclays High Yield Very Liquid Index; U.S. Treasuries, Bloomberg Barclays U.S. Treasury 3-7 Year Bond Index. Past performance does not guarantee future results. Indexes are unmanaged and cannot be invested in directly. Interest-rate sensitive investments such as bonds and real estate investment trusts (REITs) came under pressure in December as the Fed raised short-term interest rates for the third time in 2017 and forecast three quarter-point increases in 2018. Despite the Fed's rate hikes, however, longer-term rates ended the year nearly unchanged. For example, the yield on the 10-year Treasury began the year at 2.45% and ended at 2.40%. In that environment, Treasury bonds declined slightly in Q4, though they produced a positive return for the full year. Global diversification also benefited bond investors, with asset classes such as emerging markets debt, international bonds and high-yield bonds delivering strong gains in 2017. With strong labor markets but little sign of inflation, the Fed indicated that it expects to continue its gradual pace of rate hikes going forward. While interest rates might move higher in 2018, it’s important to remember that bonds can play an important role in a diversified portfolio in all environments, delivering income and helping to moderate volatility when stocks encounter turbulence. Fundamental indexing outperformed market cap indexing during Q4 in three of the five major stock asset classes where we include both forms of index investments.2 For the full year, the environment favored market cap indexing, which led by between 1 and 10 percentage points across asset classes. 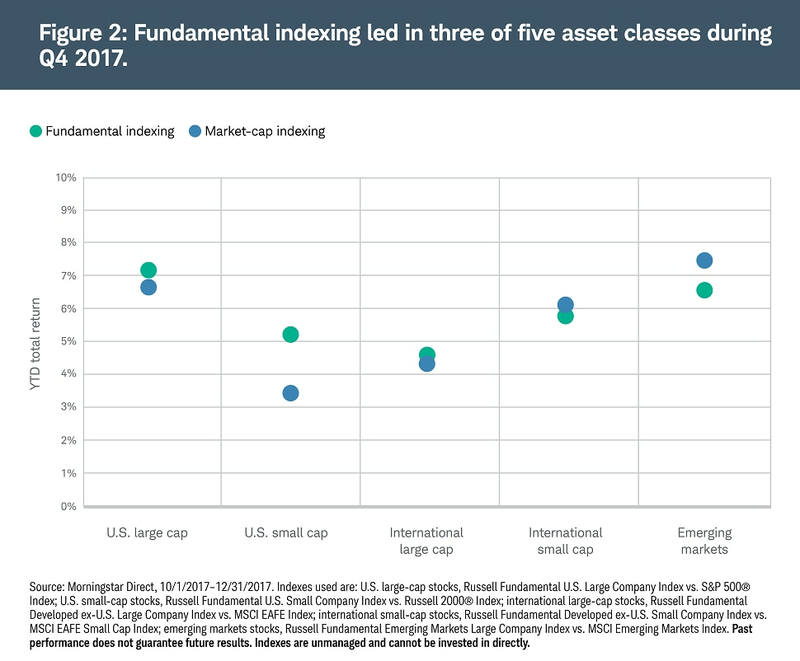 By contrast, in 2016 fundamental indexing outpaced market cap indexing by between 2 and 22 percentage points across the five major equity asset classes. These shifts in performance leadership illustrate how a combination of both fundamental and market cap indexing in a portfolio can help provide additional diversification. Each of these forms of index investing tends to lead in different market environments, so including both within a portfolio can enhance diversification while retaining the benefits of indexing such as low costs, transparency and tax efficiency. As a new year begins, Schwab's outlook remains optimistic that markets are poised to continue their upward trend. The synchronized global economic growth in 2017 shows no signs of abating, and corporate earnings growth is expected to remain strong. However, volatility is likely to return at some point and a pullback would not be unexpected given that markets remain at elevated valuations. One trend of note is that the difference between short- and long-term interest rates has narrowed, a phenomenon known as a flattening yield curve. However, the curve remains upward sloping and potential inversion does not appear imminent, which has historically tended to precede recessions. While the bull market is nearing its ninth anniversary, our view is that recession risk in 2018 appears to remain relatively low. During periods of steadily rising markets, it's important to remember that markets are volatile by nature. The extended period of exceptionally low volatility is unlikely to continue and may give way to bouts of turbulence in coming months. Investing in a diversified portfolio consistent with your goals and risk tolerance and maintaining the discipline to navigate through these inevitable periods of turbulence while sticking with your financial plan are among the keys to long-term investment success.